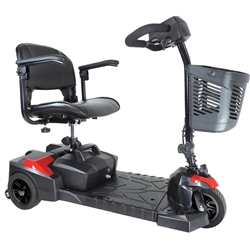 The XMB-400 has a top forward travel speed of 4 MPH and will travel 2 MPH while in reverse, and it also has a Smart Braking System is built into the electronic controller and motor. Good entry-level option for occasional outings or indoor use. 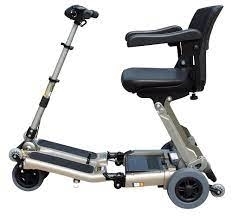 Practical scooter with a bit of extra legroom for short trips on smooth surfaces. The Zip'r 3 is lightweight, making it simple to transport. FREE 1 Year In-Home Service Warranty with Optional 2 nd or 3 Year. The ES2 is an easy to use, value-driven scooter. Dual speed settings with a portable and durable frame. NOW INCLUDES A FREE GIFT PACK— cup holder, safety flag & armrest saddle bag! Equipped with convenient feature such as a basket and flat-free tires. 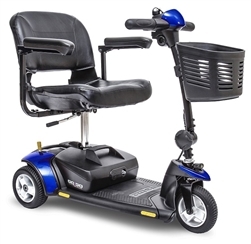 An extra-high seat and tight turning radius makes this scooter great for regular indoor use by taller riders. Now Includes 3 sets of easily interchangeable colored shrouds to customize the body. Disassembly is easily accomplished, and interchangeable panels allow color changes. It's capable of reaching speeds of 15 mph, and can travel up to 21 miles on a single charge. Shipped FULLY ASSEMBLED and RIDE READY. Now 3" longer than other scooters for more legroom and comfort while riding all day. Now Includes 2 sets of easily interchangeable colored shrouds to customize the body. New frame design easily disassembles into five different pieces for storage and transportation.. The Sport's 3 inch ground clearance and larger rear tires give you the ability to travel off-road. Another Plus is this model is 3 inches longer than the Go Go Elite (SC40E) which is great if you are taller. With non-marking, flat free tires, it will eliminate any concerns about travel. Ease of use is the name of the game with this collapsible motorized scooter. The full size (47” long and 21” width) gives a great option for those needing a little extra leg room! Feather-touch disassembly permits simple frame separation with only one hand. The EV3 Three Wheeled Electric Mobility Scooter, is finished in Black, Blue or Burgundy. 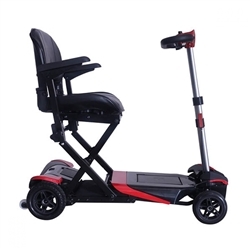 This mobility scooter is intended mainly for outdoor use, but you can ride indoors as well outside. Fully adjustable tiller - height and angle for maximum comfort! Automatic folding & unfolding within seconds using a remote control! Height and angle adjustable steering tiller to fit individual user needs.r! The Transformer folds into a very compact and easy to manage unit! Easily breaks apart into 3 sections with lightest section 27 lbs. No tools required. Rechargeable Lithium Ion Battery – long lasting up to 12 miles. Travel Mobility 3-Wheel Scooters have 3 three wheels and allow for easy maneuverability both inside and outside due to their tight turning radius. Wheelchair Authority Whether the need be an electric wheelchair, scooter, rolling walker or custom handcycle, Wheelchair Authority has the right product for your needs. Our customer service team staff staffs two RESNA certified wheelchair seating experts! Were not a high volume dealer, but a dealer that insist our clients, get the proper wheelchair, and it correctly fits! Our long standing manufacture relationships allows us to offer new manual wheelchairs, electric wheelchairs, electric mobility scooters, wheelchair and scooter lifts, and lift chairs at the lowest possible prices everyday. 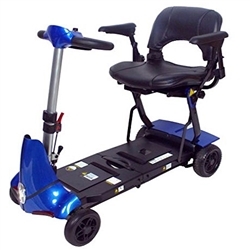 We carry all the top brands including Invacare, Top End, Sunrise Medical, Quickie, Pride Mobility, Drive Medical, ROHO, Medline and many more. Shop online, or call our expert staff now! We here for you, and can be reached at 866-218-0902! Copyright © 2014 www.wheelchairauthority.com. All Rights Reserved. Built with Volusion. Design by QCM Media.